Which Version Control System do you currently use? This year’s results continue to provide an interesting insight into FB user’s version control tool of choice. 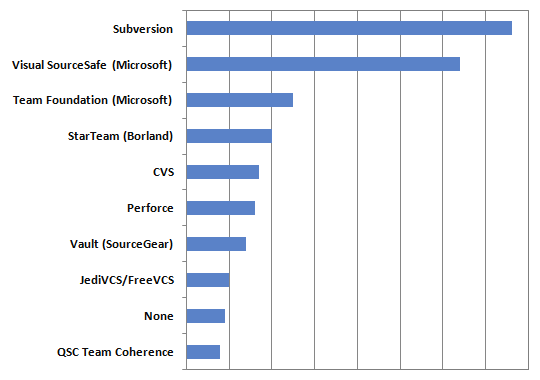 Subversion has successfully grown to become number 1 among our customers. This is only a few years after trailing SourceSafe significantly in our 2005 survey. Despite the efforts of some influential commentators in the developer community (one in particular comes to mind), SourceSafe continues to be a very popular VCS, at least among FinalBuilder customers. It’s interesting, and quite surprising, to see the number of FB users who choose not to use a version control system. We tend to think of FB users as very savvy developers who seek out tools and technologies to improve their productivity, the type of developers some people generally include in the controversial 20% category. However, a surprisingly large number seem to choose not to use version control. I deliberately say choose, because I imagine every developer using FB is well and truly aware of both the options and benefits of using source control. TFS hasn’t come close to SourceSafe in adoption among FB users. I may be told I'm comparing apples with oranges, but it doesn't even look like adoption has grown much since 2006. A few caveats about comparing this year's results with those of previous years. Each year’s survey has a random sample. This year, the VCS question was also worded slightly differently to that used in previous years. In any case, it’s great to know that FinalBuilder supports all of the top 10 Source Control systems, in addition to many others. This is the 2nd post in a series discussing insights uncovered in the 2008 FinalBuilder survey. Future posts will look at testing tool usage, Vista adoption and the pervasiveness of Continuous Integration. Distributed verison control systems are gaining in usage and popularity, but many organisations still use traditional centralised VCSs like Subversion and Visual Source Safe. Recently I've been using a hybrid setup and getting many of the benefits of a DVCS without needing to move the whole team to a new VCS platform. We recently surveyed the existing FinalBuilder customers, and one of the questions was “Which Version Control System do you use?”. What's in a name.... CLR Version 3? The Microsoft .NET framework version 3 is not a new version of the framework... just a bunch of additions to version 2.0, so why did they decide to call it version 3? Ok, this is pretty off-topic.... but is quite funny. This conversation just took place at one of the places where I do a bit of consulting work. Hi Leor &amp; Fyodor, &lt;br&gt;&lt;br&gt;No new stats. We will do the next FinalBuilder survey after the release of version 7. &lt;br&gt;&lt;br&gt;Leor, the units of the X axis are number of respondents. Any new statistics ?&lt;br&gt;Any what are the values/units on the X axis? &lt;br&gt;&lt;br&gt;Thanks! Have you got new stats? Thanks!